What are you working on—on the side? I’m fanatic about discovering new culinary experiences, so many of my hobbies involve food in some way. Two major side projects around food that I’ve maintained for several years are Tasty Snacking and Eater’s Digest. Tasty Snacking is a snack review site (that’s also on Instagram and Twitter) where I document all of the snacks I get a chance to eat. Snacks provide a fascinating cultural lens into regional tastes, and I’m always seeking unique and unexpected treats in my travels. I was dissatisfied with existing snack blogs, which largely focus on junk food, and I wanted to create a resource with a broader selection of snacks, from large brands to specialty items, both local and international. It’s also incredibly helpful to me when I go shopping and want to recall which snacks are worth purchasing again. Eater’s Digest is a college radio show on WMBR that focuses on both food and music. I co-host the show with my friend Philipp Schmidt, and the format is constantly evolving. Generally, though, we incorporate interviews with special guests who share their individual culinary perspectives. I previously hosted an indie-rock radio show, and Eater’s Digest gave me the chance to merge my interests by interviewing touring artists about eating on the road. Through the show, I’ve met some of my favorite artists, learned about new restaurants, and compiled a map of recommendations that I hope is a useful resource to anyone looking for a place to eat. I have many other food-related side projects, including a restaurant business card and menu collection, and a restaurant review journal, but those are stories for another time. The most important trick to maintaining my side projects is consistency. 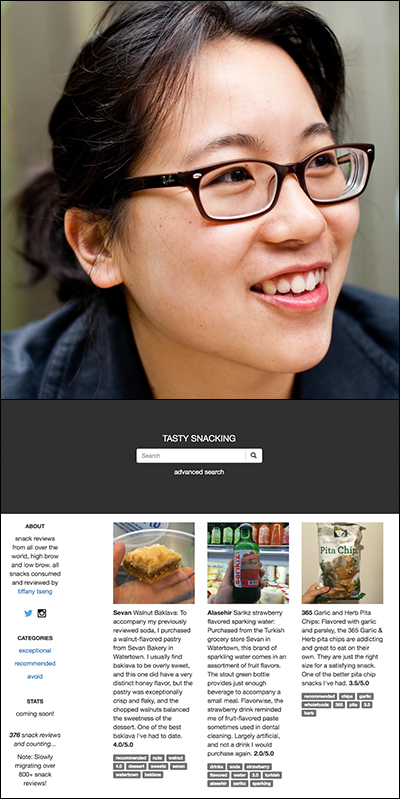 I try to write two snack reviews for Tasty Snacking every day, and Eater’s Digest is on the air every other Thursday evening. There are also many small wins for each project—it always feels like an accomplishment recording an interview or writing a glowing review, which helps provide positive momentum to continue. Why have a side project? Side projects are incredibly important for me to have a no-stakes space to explore and create. For example, both Tasty Snacking and Eater’s Digest let me exercise my communication skills. I’m a pretty shy person, so having the courage to approach strangers and talk to them about something I love has helped me become a more confident person. For my work, I generally write for an academic audience, and it’s refreshing to have a venue for more informal writing with Tasty Snacking. 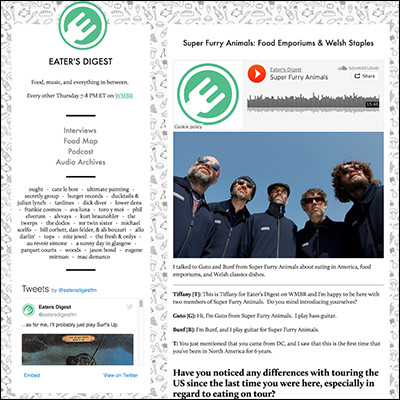 Furthermore, I use it as a chance to do design work too—I designed the logo for Eater’s Digest, and I created a website from scratch for Tasty Snacking. Ultimately, side projects are a matter of finding activities that are rewarding and provide balance, while incidentally enabling you to develop the skills you’re interested in expanding. Images courtesy of Tiffany Tseng. Read more about the joy of side projects. This series, devoted to side projects, is delivered in association with Chicago creative agency 50,000feet—dedicated to helping brands and businesses soar. If you liked this lovingly-made interview, show your appreciation by helping to support my labor of love—Design Feast, which proudly includes this blog. Learn more.